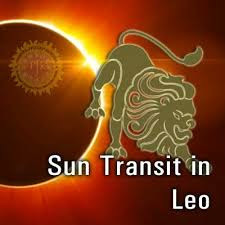 Sun is going to enter in Leo sign on 17th August. The condition of Sun is very good in this zodiac. Sun is in his house and very strong. In some condition, the Mars has impact on Sun. This condition will good. This effect will remain for one month. There will different changes on different zodiac. Aries: The time is good child. You may get sudden financial benefit. Offer water to Sun daily. Taurus: They may get property benefit. There may be change in employment. It is beneficial to do fast on Sunday. Gemini: They can get success in career. One may go on beneficial journey. Chant Sun psalm in the morning. Cancer: They may get success in career. Pending work will finish. Keep fast on Sundays and wear copper ring. Leo: There are chances of financial benefit and relocation. Health will improve. Chant Gayatri psalm daily. Virgo: They may get benefit from far away. There are chances of change in employment and relocation. Do not get anger. Offer water to Sun. Libra: Financial condition will improve. Career related problem will remove. Offer water to the Sun daily. Scorpio: There will be improvement in career. They get fame-position. Offer water mixing turmeric to the Sun daily. Sagittarius: There are chances of long journey. They will get praise for work and hard work. Avoid black clothes and give respect to father. Capricorn: They may get sudden financial benefit. Take care of injury. Chant Aditya Hriday Strot regularly. Aquarius: There will be improvement in health and career. They will become spiritual strong. Offer water mixing rolli to the Sun daily. Pisces: Pending work will finish. There may be change in employment or business. Offer water mixing rolli to the Sun daily. Good Luck: In horoscope, if Sun is weak then wake up early in the morning. Use more jaggery and wheat in food.